Shoshana Damari was born in Yemen in 1923 and brought to Palestine by her parents as a toddler. As a young child she joined her mother as she entertained at family gatherings and community events. By the age of 14 Shoshana was already performing regularly on the radio. Her exotic beauty, along with her distinctive husky voice and Yemenite accent brought a uniquely Middle Eastern flavor to mainstream Israeli music which had previously been totally dominated by Eastern European influences. During the fight for Israeli independence she frequently performed for the troops. Her inspiring renditions of fighting songs made her a favorite of Israeli soldiers. She became especially well-known for her association with Israeli composer, Moshe Wilensky. During her first American concert tour in 1949 she recorded Voice of Israel, an album of her favorite concert numbers. 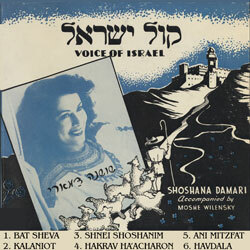 This album, along with several live performances recorded from Vistas of Israel radio broadcasts, comprise the JSA’s Shoshana Damari online collection of recordings. In celebration of Israel’s Independence Day (May 9, 2011) the JSA has compiled a special Israeli music mix to honor the spirit of the pioneers. During the 1960s and 1970s the State of Israel produced Vistas of Israel, a series of original half-hour broadcasts which were aired on local radio stations throughout the USA. The programs featured popular Israeli performers of the day, topical discussions, and interviews with prominent government officials and academics. The Judaica Sound Archives has been fortunate enough to acquire an extensive collection of these Vistas of Israel radio broadcasts. Over 400 of these recorded programs will eventually be available to you on this website. The music and topics on these recordings represent an important time in the history of Israel and remind us of the eager pioneer spirit that founded the country. This special JSA collection of songs from Vistas of Israel features the voices of Hendl and Eliran, Shoshana Damari, Theodore Bikel, and Yafah Yarkoni. Unfortunately, the specific dates of these broadcasts are not known.